If nothing else, Hideo Kojima knows how to work a crowd. So it's only natural that he'd have something extra planned for the public day live performance of Tokyo Game Show 2013. In addition to the 12-minute Ground Zeroes demo, Kojima also treated spectators to a brief side mission demo. 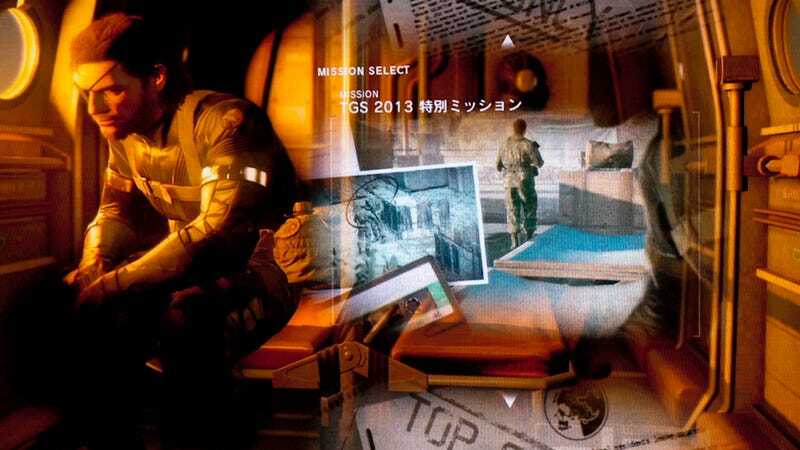 Made specifically for the limited time they had, the side ops mission demo, titled TGS 2013 Special Mission, showcased a few details of the game that have not been covered before. TGS 2013 Special Mission took place in the Ground Zeroes enemy base, except this time it was during the day. The objective was to make contact with an undercover agent, obtain information from him, and escape. The undercover agent in question was a character with an LA staff animator's face scanned in. According to Kojima, other staff members will appear throughout the game in such a manner. The mission began with Big Boss hiding in a truck that was driving around the base. By peering out behind cover every now and then like a meerkat as the truck was driving, Big Boss would target enemies either with his binoculars, or by aiming at them with his gun and tag them so they could be tracked—similarly to the Far Cry 3 enemy tagging system. After a potential candidate was spotted and tagged, Big Boss hopped off of the truck once he was out of sight and closed in. While in the demo, the target character was fairly easy to spot, Kojima warned that in the actual game, such missions would be much harder with objectives deep within enemy territory, or with similar-looking targets littered throughout. Big Boss grabbed the agent and interrogated him (Kojima stated that interrogations in the game would be a lot of fun). The agent revealed that the objective information had been recorded in a cassette tape and was located at a different spot marked on the map. Big Boss knocked the agent out to preserve his cover and quickly made his way through the base to the cassette tape in question, neutralizing a few enemies along the way. Upon finding the cassette tape ("We got Sony's permission to use their logo" Kojima said with a laugh… This'll be awkward on the Xbox) Big Boss called in a helicopter for pickup. Helicopters can only be summoned to specific points on the map, and each point has a color-coded danger rating. Kojima noted that simply finding an objective is not enough; missions are only completed when you escape the map. Before the chopper arrived, Big Boss was discovered with the standard "!" and the audience was given a look at how the gun battles would play out. For the most part, it was fairly similar to most FPS shooting systems. The damage system was similar to your standard military FPS game, with splotches and visual degradation appearing on the screen as more damage was suffered. Either Big Boss was surprisingly resilient for his age, or the demo was specifically set so that while he could take damage, he couldn't be killed, because the he got peppered with enough enemy rounds to make him magnetic. Big Boss healed over time, but there was no indication as to whether he would heal fully or only partially. During the commotion, the extraction chopper got shot down. Kojima warned that only 1 helicopter could be summoned per mission and that now Big Boss would have to get out via land route – something that was made highly difficult with the appearance of an enemy armored vehicle. The armored vehicle in pursuit, Big Boss made a run for a nearby cliff overlooking the ocean. Cornered, he quickly lay down some C4 in the road. As the armored vehicle approached, he detonated the C4 and quickly lowered himself over the cliff. Dangling by his hand, he watched as the armored vehicle sailed over the cliff above him and exploded below in a moment of spectacular badassery – though one is forced to question how often such a move will actually be necessary in the actual game. Making his way back, Big Boss managed to find an empty jeep which he quickly hijacked and drove out of the base. At the end of the road was an enemy roadblock and the demo switched to a cutscene with the jeep crashing through in an awesome Dukes of Hazzard manner. The demo ended with a message saying that the contents of the tape would be revealed in the full game. Kojima stated during the event that Ground Zeroes would be the prologue, and the side ops missions would be part of that prologue. While playing the side ops would be optional, they would offer different ways to play and would have benefits that carry over to the main game, such as captured characters showing up in your main base of operations as allies. Metal Gear Solid 5: The Phantom Pain is scheduled for release on the PS3, PS4, Xbox 360, and Xbox One.